I was never big into sports games, but NBA Jam helped get me into the genre by being fun and cartoony. As for Actraiser, I remember playing that game at a friend's house. But I never played the Simcity element, due to the fact that my friend's brother unlocked the "levels only" option, so that was how I played it. Final Fight was amazing... but the Arcade Version was much better. 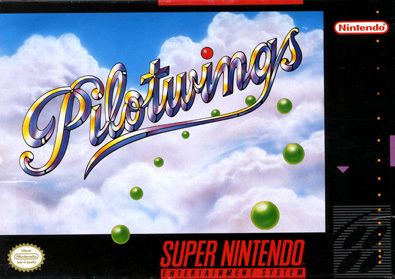 Pilotwings is a flight simulator game released in 1991 with the lanch of the Super Nintendo. It was developed and published by Nintendo. The player assumes the role of a trainee pilot in a flight school called “Flight Club”. Levels 1 through 4 contain some combination of 4 exercises: Light Plane, Rocket Belt, Skydiving, and Hang Gliding. Players are scored for each event based on a various criteria, and must obtain a certain number of points in order to advance. Level 5 has the player piloting an attack helicopter to rescue his instructors from terrorists, dodging surface to air gunfire. Levels 6 through 9 are repeats of the first four levels, but with higher point requirements and adjustments to the difficulty through various hazards (wind, ice, rain, and darkness). Level 10, the final level, returns to the helicopter rescue. We got this game along with our Super Nintendo in early 1991. I didn't like it at first, but it grew on me after a while. My younger brother was always a little better at it than I was, and he beat levels sooner than I could. When he did this, he closely guarded the passwords so that only he could access these levels. He went so far as to cover the monitor when he was entering the password so we couldn't see him. I've never played PilotWings, it does look impressive for SNES, a bit like StarFox in the tech there. I remember Pilot Wings 64 was one of the N64 launch titles. And gotta love Final Fight. Pilotwings was fun, but make no mistake... it was TOUGH. I never could master landing that damn glider on target. Getting the hang glider bonus stage was nearly impossible. You had to land the glider on the rocketbelt / skydiving target. Yeah just like Hall and Oates said, I can't go for that. The difficulty curve with the hang glider was just too damn high. I tried Hang Gliding once. And by "try" I mean was forced to, and by "once" I mean I was a child. F-Zero is a futuristic racing video game developed by Nintendo EAD and published by Nintendo for the Super Nintendo Entertainment System (SNES). The game was released in Japan on November 21, 1990, in North America in August 1991, and in Europe in 1992. 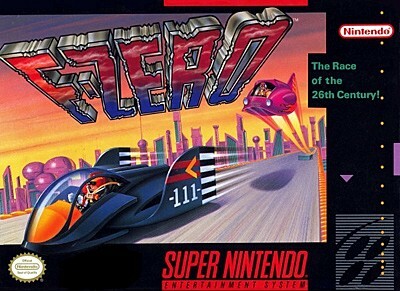 F-Zero is the first game of the F-Zero series and was one of the two launch titles for the SNES in Japan, but was accompanied by additional initial titles in North America and Europe. It was re-released for the Virtual Console service on the Wii in late 2006, the Wii U in early 2013, and on the New Nintendo 3DS in early 2016. Nintendo re-released F-Zero in the United States in September 2017 as part of the company's Super NES Classic Edition. The game takes place in the year 2560, where multi-billionaires with lethargic lifestyles created a new form of entertainment based on the Formula One races called "F-Zero". The player can choose between one of four characters in the game, each with their respective hovercar. The player then can race against computer-controlled characters in fifteen tracks divided into three leagues. F-Zero has been acknowledged by critics as one of the greatest video games of all time as well for setting the standard for the racing genre and the creation of its futuristic subgenre. Critics lauded F-Zero for its fast and challenging gameplay, variety of tracks, and extensive use of the graphical mode called "Mode 7". This graphics-rendering technique was an innovative technological achievement at the time that made racing games more realistic, the first of which was F-Zero. As a result, IGN credited it for reinvigorating the genre and inspiring the future creation of numerous racing games. In retrospective reviews of the game critics agreed that it should have used a multiplayer mode. F-Zero is set in the year 2560, when humanity's multiple encounters with alien life forms had resulted in the expansion of Earth's social framework. This led to commercial, technological and cultural interchanges between planets. The multi-billionaires who earned their wealth through intergalactic trade were mainly satisfied with their lifestyles, although most coveted more entertainment in their lives. This resulted in a new entertainment based on the Formula One races to be founded with vehicles that could hover one foot above the track. These Grand Prix races were soon named "F-Zero" after a rise in popularity of the races.The game introduced the first set of F-Zero racers: Captain Falcon, Dr. Stewart, Pico, and Samurai Goroh. IGN claimed Captain Falcon "was thrust into the limelight" in this game since he was the "star character". An eight-page comic was included in its SNES manual that carried the reader through one of Captain Falcon's bounty missions. Loved this game. Played it extensively in the early 90s. Never beat it though. It gets pretty tough near the end of the King Cup. I got it on my Wii Virtual Console a few years ago, though I didn't play it much there. Sunset Riders is a side-scrolling run and gun video game developed and released by Konami as a coin-operated video game on the JAMMA arcade platform in 1991. Another one of those games I never heard of until this list. That's 5 for today. 5 more tomorrow. F-zero made my list but now that I think about it, I wonder why because I vastly prefer Super Mario Kart. I played Sunset Riders quite a bit in the arcade. The SNES version is surprisingly arcade accurate, except for the Indian level being notably lacking in Indians. Which actually makes the game easier. The Indians would actually take cover and fire over the rocks. Arrows are surprisingly harder to dodge than gun fire. Incidentally, Sunset Riders also appears on the Arcade Games LoC, which I did, and you can see in my sig. It's tied at #50. I also prefer the SNES's Wild Guns to Sunset Riders. 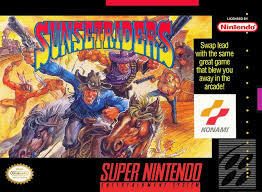 Sunset Riders rocks, lotta fun. Wild Guns is fun too no doubt, Sunset Riders hits that sidecrolling action beat-em-up but with guns niche.